"For Distinguished Services for the Motherland"
The Kalashnikov rifle: Naked trademark licensing (“I take them into my hands and, my goodness, the marks are foreign,” [General Kalashnikov] said of the knockoffs the Soviet Union once championed. “Yes, they look alike. But as to reliability and durability — they do not meet the high standards of our military” at its bloodiest). UPDATE: Much more, and done better, here. Also a good piece about the man and the weapon here and here*. 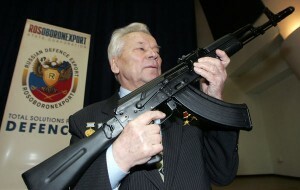 NEW AND IMPROVED KILLING POWER: The AK-47 (i.e., the Avtomat Kalashnikov 47 — does that mean you could buy one here?) as “Most Important Weapon Ever” (via Instapundit).